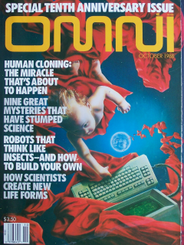 The OMNI magazine October 1988 issue had an article by Dennis Stacy and Kevin McKinney, "Lee County’s Lizard Man and other Unsolved Mysteries." It was a collection of nine cases of strange, unexplained events, billed on the cover as"Nine strange mysteries that have stumped science." One of the cases feature was the Cash-Landrum case. Dennis Stacy was a staffer at the MUFON UFO Journal and was its editor from 1985 to 1997, so he was able to get good sources for the story. His co-author, Kinney was an associate editor for OMNI. The story is good, but contains some biases probably generated at the source. The most valuable thing it provides are quotes from those involved in the legal case, unique quotes from attorney William Shead, Assistant U.S. Attorney Frank Conforti, as well as defiant closing comments from Betty Cash. 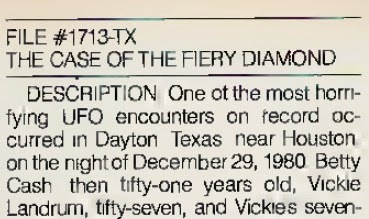 From the article "Lee County’s Lizard Man and other Unsolved Mysteries"
DESCRIPTION: One Of the most horrifying UFO encounters on record occurred in Dayton, Texas, near Houston, on the night of December 29, 1980. Betty Cash, then fifty-one years old, Vickie Landrum, fifty-seven, and Vickie's seven-year-old grandson Colby Landrum were returning from a bingo game. Driving along pine-tree-lined rural Highway FM1485, they allegedly sighted a hovering "diamond of fire" belching flames and emitting air-brakelike sounds. Cash brought her Oldsmobile Cutlass Supreme to a halt, and all three passengers got out to take a closer look. As they gazed in awe and terror, more than 20 helicopters suddenly appeared and circled the fiery object, trailing it when it finally flew away. Betty Cash remained outside the car longest, until the heat became unbearable. When she attempted to reenter the car, the door handle was so hot that she had to grasp it with her coat. EVIDENCE: The fiery diamond left behind a legacy of illness and suffering that continues to afflict the three victims. Within hours they were medically treated for "sunburn," as well as recurring bouts of vomiting and diarrhea — apparently the results of radiation sickness. Cash’s skin blistered so badly she was hospitalized. A week later, moreover, her hair began falling out in clumps. Their health problems have continued to mount: Cash has undergone a mastectomy and suffered a heart attack. Landrum's vision has deteriorated, and slow-healing sores have broken out on her hands and feet. Young Colby's eyesight has also rapidly deteriorated, and abnormal patches of hair have sprouted on his chest and back. WITNESSES: There are at least six other eyewitnesses who saw the helicopters. There seemed to be no reason, at the time, to report the choppers to the police. The witnesses surfaced later, however, during a Mutual UFO Network investigation led by aerospace engineer John Schuessler. STATUS: "We have used the term UFO only for want of a better word," Schuessler explains. "It could have been a secret military experiment, for all we know." The helicopters were the basis for a lawsuit, according to Bill Shead, one of the plaintiffs' lawyers. "The government had to own them, and it is, therefore, responsible for damages." Both the Army and the Air Force, however, deny any knowledge of the event. "Whatever they saw and whatever happened is not the issue," says Assistant U.S. Attorney Frank Conforti. "The question is. Why are they suing the government? It's like somebody hits your car and you decide to sue me, even though I'm not responsible for the accident." In September 1985 a federal district court dismissed the $20 million civil suit for injuries inflicted during the alleged encounter. "That's it, as far as the court system goes," Shead says. The only possible relief for the victims is a congressional resolution awarding damages. "It's rare, but it has happened before." Cash, however, remains unmollified. "Even if the government didn't know what the object was then, it does now," she says. "Those helicopters were there, and for the judge to throw the case out, not even hearing us, is a sad decision," She adds that she'll "do whatever it takes" to bring attention to the dismissed case. "I'll fight until they lay me in my grave," she says. "I want people to know how our federal judicial system works." RECOMMENDATION: The three victims saw something. Suggest you follow up on lawyers' or victims' future tactics. Anyone in the vicinity of Houston should be particularly observant if driving along Highway FM1485. Betty Cash petitioned Congress to investigate the case, but ultimately it was lost in the noise of Washington DC.